Oh hey guys, I'm back in action! Last week Jeff and I flew to Vegas for two nights to celebrate our anniversary, and then met up with Jeff's family in Lake Tahoe for some R&R. This was our third trip to Vegas together, and at this point we know exactly how we want to spend our time - a lot of drinks at the pool, a walk through the Bellagio, good food, and trying not to lose too much money at the craps table ;) I always hear from people that they're too scared to play craps because there are so many rules, but really all you have to do is put a little money on the table for an opening bet and celebrate whenever everyone else does! Now I get a little more crazy on the tables but I literally just did the opening bet when I first started playing and still had a lot of fun - I love interacting with other people at the table and seeing everyone's crazy superstitions up close. We also decided that as part of this trip we should add in a show, and decided to go see Britney Spears! A lot of people assumed I dragged Jeff to it, but he was just as excited as I was. Some of that excitement on his part may have been getting to meet one of the bartenders for the show - because Jeff and I are still 14 years old we love The Challenge on MTV, and Leroy works at the bar for the show. We super creeped on him and managed to get him to serve us and got in a little chat ;) Britney was hilarious and awesome and so bad it was good, and I would definitely recommend checking it out if you're in Vegas. 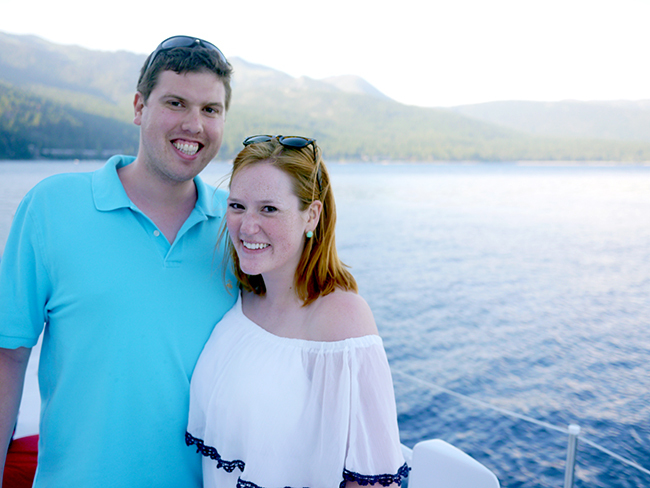 Our week in Tahoe was so much fun. We did a little bit of hiking, a little bit of pool and beach time (where you may have seen on Snapchat that we met Melissa Joan Hart haha), and a lot of bit of relaxing and enjoying family time. We actually had planned on doing a lot of hiking, but after one "Easy" level hike we determined that hiking might not quite be in our wheelhouse hahaha ;) I actually was worried about hiking because the last time I took a trip to the mountains I was fourteen and just remember complaining non-stop and begging to go home. It turns out that maybe I was just an annoying teenager because I liked those "Easy" hikes! So anyway, I would say that I'm home now and getting back into my routine, but that would be wrong. I'm actually flying off to San Francisco again this morning for work for a few days. I remember I used to be jealous of people who got to travel for work, but between all of the trips I've taken lately it's making me feel exhausted! This time I'm refusing to unplug though, so I'll be right here all week.